391. If the number of students passing an examination be considered a criteria for comparision of difficulty level of two examinations, which of the following statements is true in this context? 392. How many students are there in Class IX in the school? 393. Which section has the maximum pass percentage in at least one of the two examinations? 394. Which section has the maximum success rate in annual examination? 395. 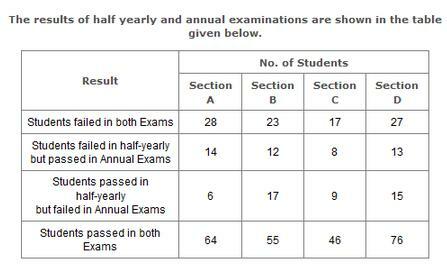 Which section has the minimum failure rate in half yearly examination?